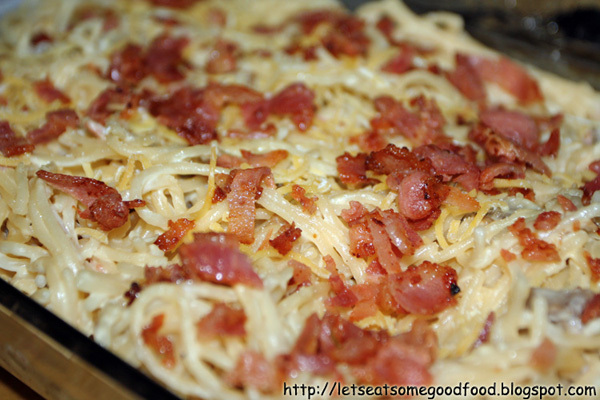 Pasta Carbonara Recipe – Eats Yummy! Pasta Carbonara or Carbonara Spaghetti is one of the famous white sauce pasta recipes using fresh milk and all-purpose cream as main ingredients instead of the usual tomato sauce and meat for red sauce, this good food dish is topped with bacon to complement the creamy taste of the sauce. It is definitely one of the popular pasta recipes that everyone would enjoy at home. The recipe for this one is just easy to cook and follow. Try it now this easy and you will have your Pasta Carbonara at home in no time! Heat butter in a sauce pan and saute garlic and onions until fragrant. Add ham and mushroom and saute until cooked. Add cream of mushroom and bring to boil. In a bowl, combine fresh milk and all-purpose cream and mix to blend. And then pour the mixture in the saucepan and stir in one direction. (Stirring the white sauce in one direction will lessen the possibility of early spoilage). Bring to boil. Add the cooked spaghetti and toss to coat noodles with the sauce. Add salt and pepper to taste. Transfer to a serving plate or dish and serve topped with bacon bits and grated parmesan cheese. nice carbonara ha. yummy talaga sya. try ko to. .